This entry was written by Tomás, posted on 15 July, 2009. Filed under In general and tagged books, design, Esslinger, frog design, innovation. Without any doubt, frog design is one of the biggest and more interesting design bureaus in the world. With offices in many cities –such as San Francisco, Seattle, Amsterdam, Stuttgart or Shanghai– and clients from a list that could wallpaper an exhibition room with the heavy-weights names from any industry, they have created a strong reputation based on high caliber design and a high dosage of innovation. And now it came another piece on this communication clockwork: ‘a fine line: how strategies are shaping the future of business’, a book by Hartmut Esslinger, the person who founded the company back in 1969 in the heart of Germany’s Black Forrest. The book –according to what you can smell from ‘Chapter One: Design driven strategy’ (PDF)– is full of insights on frog design processes, based on first person experiences on the board of decisions of countless projects. It is also charmingly written, becoming a very engaging road for any reader. In brief, it’s a must. 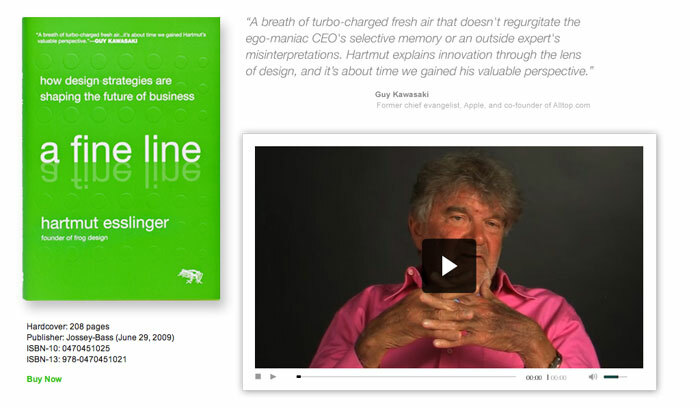 Extra note: Guy Kawasaki interviewing Hartmut Esslinger: “The Inside Scoop on Design: Ten Questions with Hartmut Esslinger”.